We can provide you with everything you need to build an ultra-functional basketball court that meets standard regulations. 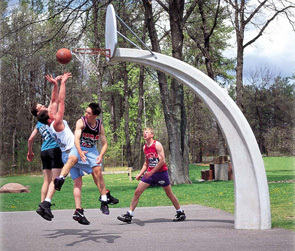 Let us make building your next outdoor basketball court a slam dunk! 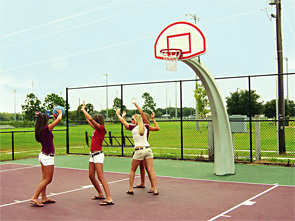 The standalone standard concrete basketball post backboard and net mount is the ultimate in basketball equipment. 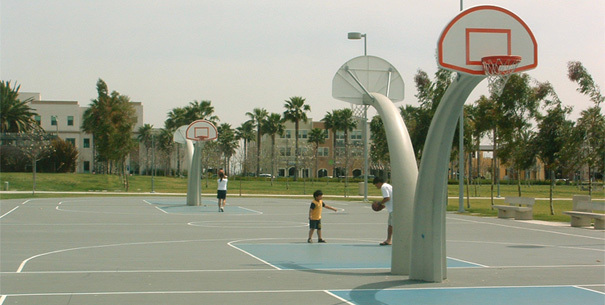 This concrete basketball post serves as a basketball court equipment mount and features the durability of precast concrete with a shape that keeps the post safely out of the way of the game. Safety was the top priority when designing the concrete basketball post and equipment mount. Add a backboard and rim to complete your modern basketball court. Choose between a standard double basketball rim or a flex-mount double basketball rim. The flex-mount breakaway official sized double basketball rim features added flexibility to absorb the shock of player contact. Spring action is provided by a compression spring. Both basketball rims are powder-coated orange as shown and include nylon style nets. Aluminum basketball backboard is constructed with 3/16" cast aluminum with a total thickness of 1-3/8". mounts and hardware are included. Galvanized steel backboard support brackets are sold separately.